Well at the moment I’m working with my Italian heritage: my parents migrated from Sicily out to Australia.I love painting going out in the bush and I love the country here which I was born in, but I also spend a lot of time in Italy (I have got dual citizenship) and a lot of family, about fourty relatives. 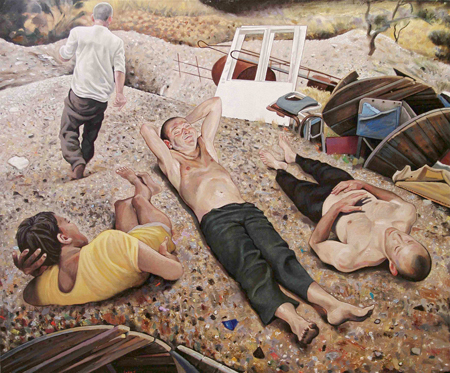 I went back recently with Euan McLeod, we were painting for a couple of weeks and he suggested I should be painting my family rather than my usual models and start and analyse my background more. I’ve always painted figures as well as the landscape. That is because the figures are very important within the landscape for me, they sort of “activate” that land. So I go back regularly, particularly in a small Island called Filicudi, in the Aeolian Islands and I am starting to place my family members within the Italian landscape. I sort of try to explore the relationship between Australia which is large Island and Filicudi which is tiny, with only 200 inhabitants…and I’m related to about a quarter of them! It is quite interesting, because I am taking myself out of my comfort zone which is the land here, that I know comfortably, although I grew up raised as an Italian really, Italian was my first language. AP: were you raised in Sydney? Yes, but we spoke Italian up until I went to school. While that history sort of gets washed away as you move into a new “cultural place” at school, it is still inbuilt in you…so I really wanted to explore that more. I started to go back to Italy regularly from when I was about 20 so the link was strong but I never really explored that within my painting. I re-established the family link because nobody had returned from Australia back to the Island before me. I took my father back home, he had not returned in 37 years….that was very emotional. Since, I have visited every 18mths or so, every time I go to Europe (for solo exhibitions for instance).….If they find out I am in Europe and I haven’t visited I am in big trouble! I have only just started this series really. These small landscapes here where done actually Plein-air, over there. I did a number of them. Now I am putting everything out and I am starting to plot. This series should keep me going for two years or so I think. WHAT IS YOUR PREFERED EXPOSURE TO THE LANDSCAPE? I work both from plein-air and from memory. These plein-air works are not necessarily great works but they capture the first impressions, the colour range of the place and so on. These will then activate memory when I am back in the studio. I usually do 50 or 60 little plein air studies and from that I construct images when I am back in the studio, I start adding other elements. Sometimes Plein-air can be quite literal but it also cuts out a lot of the static, which you would see more if you worked off a photograph, because you would tend to focus more on details. 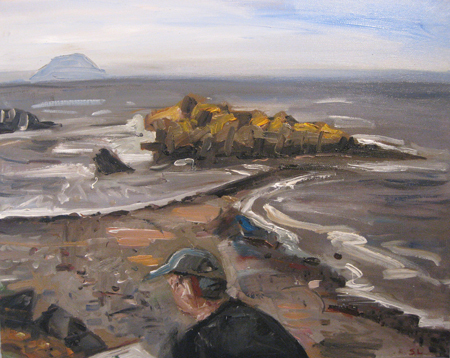 Plein-air as you know doesn’t give you a lot of time to work so you pick the important elements. These are also the parts that will last in your memory. Extrapolating on them when back in the studio is what makes an interesting picture. Something more than just a literal transposition of what you saw. AP: as a plein-air painter I find that not having much time to capture the essence of a place forces your focus and the intensity of the stare… Looking at the studies back in the studio brings back that intensity of feeling instantly, compared to taking a photograph and in fact triggers a better memory? Yes and that’s the stuff that holds you in the studio for hours on end. You need that memory to hold you to your task. If you’re doing something just for the sake of it “I’m in a pretty landscape, I’m going to paint it”, the work will show that. The “why” you are doing it gives the substance. As you get older as a painter, I find that analysing your thought processes contributes just as much to the work as you hand-eye coordination. AP: this is possibly why mature painters still have a future! You may start your carrier with excellent technical skills but mature age works have the varnish of life experience included! Yes, I am convinced that you have to make a lot of bad paintings to make a good ones…. Sometimes lack of paintings skills makes a good painting as well! AP: Do you rework you plein air paintings? As I get older I tend to not touch them. I do them and leave them. AP: Do you take any photographs at all? I do, but not so much anymore. Sometimes I need more references, depending on what I am doing. I’ll look at them but I don’t necessarily paint from them anymore. I paint more from plein-air works and find I don’t need to go back to photographs. Having said that sometimes I want to do a more complex image and then they’ll help with building the composition. We recently went to Gallipoli and I did about 40 or 50 works in the landscape and then I had to do some big works: for these ones it helped to have some photos to combine with ideas from memory. Back here I was doing a painting of the trenches where the diggers fought. I wanted to give a representation of not just a trench but the IDEA of fighting in a trench, with the low point of view of looking up. So I needed many elements and I constructed the final work using elements from 15 different photos as well as sketches I did on site. Well I can show you a sketch book: this one is my Italian sketchbook and I have another one from Gallipoli. I work in them at the same time as the plein-air paintings, in the landscape. See here these lines and viewpoints are important references for the composition of the future studio works. No matter what you paint or have an idea of, if you got it down, if you have the view point of where you are looking from sketched down and it is interesting in drawing, then you can take that approach back to the canvas. So I’ll go off the sketches and work out my painting’s composition. For example, this painting here was done pretty much all from drawings. It’s all made up, it’s not really any place that existed but based on my idea of a trench. AP: The application of the paint seems looser. One of my mentors said, sometimes people are too self-conscious of what they are trying to do: they’ll try and paint loose just for the sake of painting loose, or paint tight, for the sake of it. These days I am starting to be less conscious of my painting “style”, I just let it happen, really, without planning whether it will be tight…or loose. Do you also draw for the sake of drawing, as a finished work? WHO DO YOU THINK INFLUENCED YOU AS AN ARTIST OVER THE YEARS? I went to art school at the University of NSW (Cofa). I loved the work of Lucien Freud, and number of European artists more so than Australian ones at the time. Then I went over and travelled for two years with my wife, after we got married (I was 25yo). I saw the “Great Works” in person and just having that exposure taught me more in a way than art school. I spent the two years going to every gallery in Europe and New York where I lived for a while. Velasquez was also significant for me then. 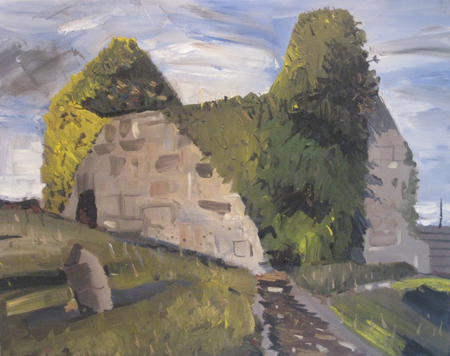 Then, Euan McLeod actually has had a significant impact on my practice: Over the last five or six years we have been good friends and have gone out painting regularly. I can say I have learnt from his experience of Australia. He is from NZ, so a migrant as well, and he basically told me to be confident in what it is I am doing: Even if it is a bit strange, not to worry about it, because that is what brought people to the work in the first place. In fact I don’t think my work fits in anywhere, which I don’t mind actually, as I get older. It’s figurative, it’s landscape, but it’s lasted, which is the most important. So I might have tried to fit in somewhat when I was younger but now I don’t care so much. Both works for me: Even if you don’t have the figure, it’s present, whether it is a rural landscape with all the relics that show the human presence or walking through the land, which shows your view point. But often figures or people and the landscape are ONE: It is where we are. We live in it. We can’t just get lost in pushing forward for technological purposes; we’ve got to live in the place. the world around us and that we are above it all…we’re not! We’ve got to live with it in a symbiotic relationship and that’s why I find that putting figures in my work and landscape is important. We were talking about influences before: well, Peter Booth is significant for me. He is an influence because he is still a European artist, coming to Australia, and he can do a landscape with detrius in it: He’ll do an empty one and then put a dark figure and a thin horizon line. And that says just as much about landscape and the impact we have on it than anything. And he is not so self-conscious whether it’s a landscape or not. I could do a lot more of interiors and figures in the interiors but I always tend to focus on the outdoors. I guess it may come from my spending so much time outdoor and in the bush when I was younger! We used to spend our holidays down the South Coast. These days I have a bush block down the South near Bungonia where I spend a lot of time camping. There is no shelter; I just purposely bought this piece of land to spend time in the bush. 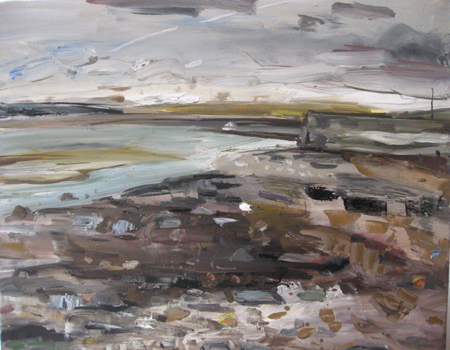 I go there and paint and stay for a few days at a time and that revitalises me, it grounds me. But I can also just spend time down here near Carss Park: I grew up here in this area, and spent my whole life around here, exploring Carss Park’s bush and the ‘mud hole’ I used to call it, near the water. It was like a little pocket of nature within Sydney, so I felt more like in the bush rather than in suburbia. AP: With the figure, is there a narrative in your work? People assume narrative but there really isn’t. Every day we wake up and think “what are we doing? We tend to think we have control over our life but we don’t really. It’s the same in the paintings, the figure ‘activates’ them. They might be doing something, but sometimes I don’t even know what they’re doing. And that adds to the beauty of what they are. Now, occasionally there may be a narrative but I’m not going to tell it. And I’ll let people to come to it in their own right. A good work has to have that “mystery” and at the same time be concise. So there is an idea of a figure, and who it is, and where I want to place him… and then from there it grows. The painting prevails and takes a direction that can be different from what I had originally anticipated. So there can’t be a narrative most of the time. AP: Does mortality have a place in your paintings via the figure? very place where they were facing the trenches of the Turkish soldiers, getting slaughtered with the bullets coming at them. Then you turn back and you see the Greek islands and Samothrace in the distance and the sun setting and it is the most beautiful view you can imagine, like a Mediterranean idyllic vista you would see on a getaway program. As they were dying, they were almost looking at Heaven, and one side was Hell. In another series, here, you can see the skull figure in this Sicilian work, about the catacombs: I went to Palermo a couple of times and been to the Capuchin catacombs where citizens from the past few hundred years are kept embalmed above ground. These preserved bodies are still present , for all to see. For Italians death is a very important part of their upbringing. Then, in my family, there is the tradition of the casket viewing, which is something we still do. It is a ritual that allows the family to say goodbye. And this is something that you do as a family, including the kids. We weren’t scared of death when I grew up. Death is a very natural part of life: In a way, it reminds you that you only have a finite time within this world so you better do something good with it. And as a painter it is also a way to leave a concrete trail…it is our way to face mortality. And that is what I think is one of the things that are involved with art and the landscape. AP: Is the figure planned from the start in the work? Not always. You were asking I rework my plein-air paintings: well sometimes I add a figure once back in the studio. And all of the sudden that figure becomes something else within that landscape and I can’t tell that when I’m out in the land. Sometimes I paint a figure when I’m out there, I’ll make it up or paint one of my friend who is painting with me then, but it may not work and I’ll paint them out. Generally in the large studio work I’ll have an idea where they’ll be in the work but this is very fluid and I can paint them out or add them in if needed. Sometimes they can become overbearing, too narrative indeed. You walk a very fine line with figures in the landscape. Gericault and Courbet are very good examples of artists who could do that well. Sometime it could just be the placement of an arm that can activate the landscape too much if it’s at 45 degrees angles and should be more horizontal. And you don’t really know that until you paint it. The picture will tell you what it needs. I think travelling overseas is very important, especially for an Australian, to give us a perspective of how our landscape is beautiful and raw. We tend to take it for granted. AP: Do you go on a Residency with preconceived ideas of what you would like to do while there? No, not anymore. For instance I am going to Hong Kong this year, which I haven’t been to before. I have purposely not looked at any books or anything. I’ll just experience it. 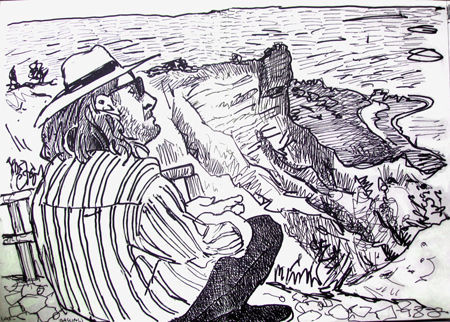 Sometimes I tend to explore afterwards…I read or document to myself about the place, but most of the times afterwards. In a way it’s the same as doing a painting: when you come to a painting with a narrow idea of what you are going to do, it becomes very ‘anxious’, very tight…..
AP: You focus on the experience rather than the outcome and trust yourself. Yes! It is about trusting oneself more. 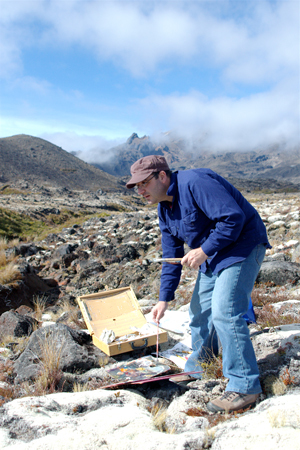 I think this really began to happen for me when I started painting with Euan Macleod years back….I think that was the New Zealand trip in 2009: He didn’t care if he was making mistakes…he was saying: don’t worry about it, if it works, it works, if it doesn’t it doesn’t…So we were just painting and all of the sudden it started to work because I didn’t care as much. I did a residency at Bundanon in 2005, the Arthur Boyd property, and I painted about sixty works in five weeks. Just being in that landscape, surrounded by the subject that I could access anytime, all day every day made me relax and I produced so much. So yes you are right, being able to trust your subject ….and yourself. DO YOU HAVE A SPECIAL CONNECTION TO THE AUSTRALIAN LANDSCAPE (VS OVERSEAS LANDSCAPE)? Because I started off with the figure and they are important to what I do, I tend to see people as just people, irrespective of the nationality or culture. As an immigrant I grew up with at least two simultaneous views of the world: an Italian and an Australian one. So bringing it back to the landscape: if you are coming to the land openly, wherever you are, you approach it fresher than if you are too attached. I think that having too much emotional involvement in a specific idea, or the way you paint, or by extension to how you approach a landscape, it tightens you up. AP: But is there a similar way in which you approach the land, whether it is in China, Italy, Australia or Gallipoli? No… I take each landscape for what it is. That allows me to see it better, I think, and I’ve learnt that from experience. In a way the painting has taught me a life lesson, about being open and flexible: Having had quite a strict catholic upbringing, I had a pretty conventional life growing up. I look at my life compared to a lot of friends who were much ‘wilder’ than me growing up and I live a much wilder life than them now, with their nine to five jobs. As a painter you have to live on the edge of your instinct and wits, day in day out. AP: You value having a fresh approach when being in the landscape. 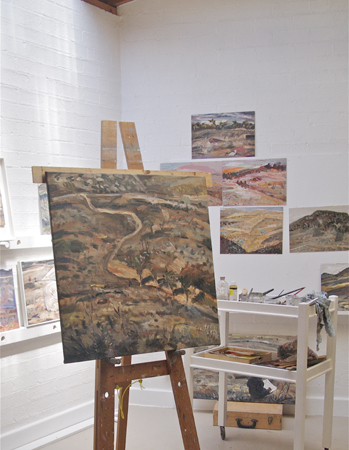 How do you progress to your studio work, where obviously you try and add an emotional depth to your paintings? Well the plein-air works give me as many entry points into my subject. While I am not especially emotionally attached to the Australian landscape, I am very emotionally attached to whatever my subject will be, always. I get that by going to the place that I want to work with, I go and visit it, and experience it fresh. I live that emotion, I breath it, paint it, eat it, visit, travel, meet the people. But then there is a settling period…to detach myself. When I look at all the great European masterpieces, all of them have a level of distance to them. That provides restraint, so what you paint becomes “object”. That’s particularly important given the way I work, which is quite detailed and representational: there are hours and hours of time, from the minute that I start a work to the minute I finish it. If I remain emotionally attached all the way, it’s exhausting and the work becomes overblown. So I have to settle, let the raw emotion pass and go straight to why that work counts, why I was interested in it in the first place. 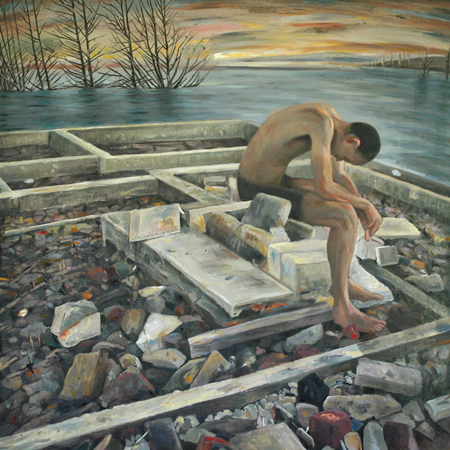 AP: after so many residencies in many different countries and landscapes, can you connect the dots, is it coming together and inform the way you paint now? …if it is, I am not aware of it. Having said that I had a small survey show in Coffs Harbour about two years ago and it was really wonderful to see old works next to new ones. ….actually…. I learnt a lot from that! Beside the fact that I realised I was OK when I thought I wasn’t crash hot as a younger painter, I actually saw that the figure was vitally important to my work. The thread between it all was the human presence. And seeing the new stuff that I am painting now in the Italian series, it is also about people trying to overpower the landscape by building these structures and constructions. SO IN CONCLUSION, WHY THE LANDSCAPE? One of the things thats precious about Filicudi is that people still live simply and the natural world is very close to their lives: we can still drink our water from the well there. Then if you go from the Island to Naples by boat in the evening, you will pass Stromboli and you see the lights of the spewing lava coming out from the volcano. That is something that is ancient and shows the primordial forces of the world that still exist and cohabit on earth with the sky scrapers and all the technology we surround ourselves with. People there live there with that constant primordial presence. Why has landscape art lasted so long? As modern humans, we are sheltered by suburbs and the thoughts that we are protected but we still have to battle the world as best as we can. Yes we have more control but it is still our challenge. Contending with Art and the landscape in a similar way that “old fashion-ness” is still relevant to the modern world. The volcano is still splattering in 2015! Steve Lopes kindly gave up two hours of a Saturday to talk to me about his art practice in relation to the landscape. Sydney-based painter and printmaker, Steve has had over twenty solo exhibitions across Australia and the UK and been a frequent finalist ina number of national awards including the Doug Moran Portrait Prize, the “Archibald – Salon des Refuses”, Mosman Art Prize . He is represented by Stella Downer Fine Art, Sydney.